The evidence showing that Santa Claus is part of a spiritual conspiracy yoked with the Devil is not that hard to substantiate. 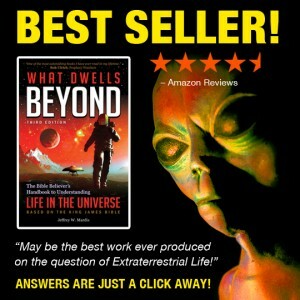 The evidence exists (note the image above). One of the most quirky examples is the name “Old Saint Nick”. On the surface the title “Saint Nick” obviously refers to Saint Nicholas of Myra, the 4th century Roman Catholic bishop whom many claim to be the “real” or “original” Santa Claus. That’s debatable. But nevertheless, many assume the name “Nick” to be a shortened version of “Nicholas”, a reference to the so-called saint. That’s no doubt true to some extent, especially as the name is used in the song Jolly Old Saint Nicholas (circa 1855) and from a stanza of the Clement Moore poem (1823). What most are not aware of, however, is that “Nick” or “Old Nick”, when used in reference to Santa Claus, may not necessarily have originated from Nicholas of Myra. There is evidence to the contrary. The name “Nicholas” or “Nick” has much older roots than simply being a derivative of a 4th century Catholic Bishop. But the saintly designation given to Santa Claus can easily be explained, whether he’s connected to the Bishop of Myra or not. Remember our study on Satanic counterfeits from Part 3? 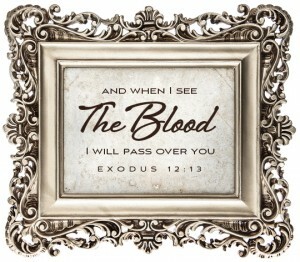 The Devil has his own “ministers of righteousness”, hence the “Saint” label (2Cor. 11:14-15). Here we see a direct link from Santa to Satan showing that both may be addressed by the name “Old Nick”. Coincidence? I seriously doubt it. But that’s not all. These two verses show that the Lord “hates” the deeds and doctrines of the “Nicolaitanes”. Whoever these Nicolaitanes are, they must appeal to some members of the Church, for some of them are holding to their practices and teachings. So who are the Nicolaitanes? The word is a transliteration of two Greek words – “Nikao” and “Laos” – Nikolaos (also spelled “Nicolaus”). Did you get that? NICOLAUS. And just as we discovered that the word “Nick” means “to slay”, so too, we find that the Bible word “Nikao” means “to conquer”.2 Laos means “a people”.3 So, Nicolaus means “to conquer the people”. It’s a religious type setup where the “laos” are conquered by a priest-class. The Nicolaitanes are lording their authority over the laity and God hates it (see 1Ptr. 5:2-3). Lo and behold, we find certain depictions of Santa Claus dressed as a priest wielding a staff, and claiming to be Saint Nikao-Laos. 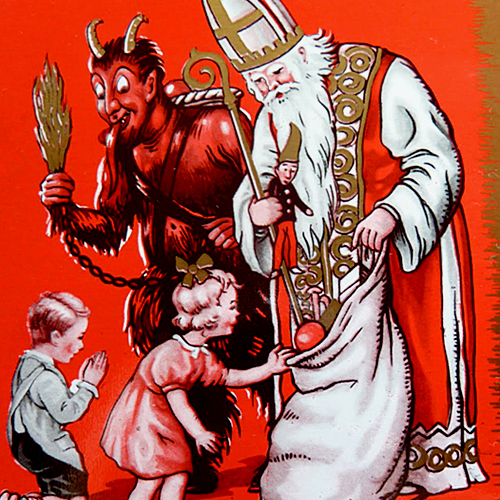 Many times this Saint Nick is accompanied by the other Nick – Krampus, better known as the Devil. Vintage images of Krampus, also known as the Devil. From the words Nikao-Laos it’s easy to see how the Devil eventually acquired the name “Old Nick”, for according to scripture, he has indeed “conquered the people”. He brought sin and death to all mankind (Gen. 3), and is referred to as “the god of this world” who “hath blinded the minds of them which believe not”. (2Cor. 4:4) This more ancient definition of the word “Nicholas”, with it’s long-running connection to the Devil, should at least give the Christian room to question the Santa tradition. Perhaps Santa’s roots don’t belong to Nicholas of Myra after all, perhaps they belong to another “Nick”? Even Hollywood is familiar with “Nick” being associated with Satan. 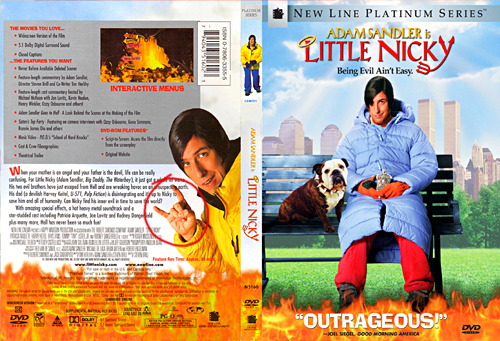 The 2002 film “Little Nicky” starred Adam Sandler as the son of Satan himself. Note the Satanic “Horned-Devil Salute” which is performed with the left hand (circled in red) on the back of the DVD cover above. Spence, Lewis. An Encyclopedia of Occultism. New York, New York: Carol Publishing Group, 1996. page 296. 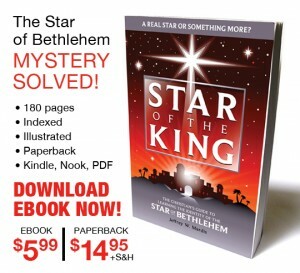 See Strong’s Concordance Greek reference numbers; 3531, 3532, 3534 and 3529. See Strong’s Concordance Greek reference number 2992. 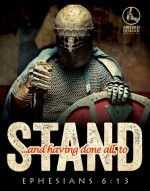 Copyright © 2009-2014 Jeffrey W. Mardis & Sword-In-Hand Publishing. All rights reserved. Standing on the King James Bible for truth, edification and discernment.